March 1, 2013 by Verle L. Bell, M.D. Everyone wants wisdom and to be considered wise. Not everyone wants to admit that their natural thoughts are not already wise. People all believe that they have common-sense, but the truth is that common sense is extremely rare. They add knowledge to knowledge and this does not produce wisdom but rather makes them puffed up. To be wise we must begin with fearing God, hating evil and hungering for righteousness. We must believe that God IS and that he rewards those who diligently seek him. 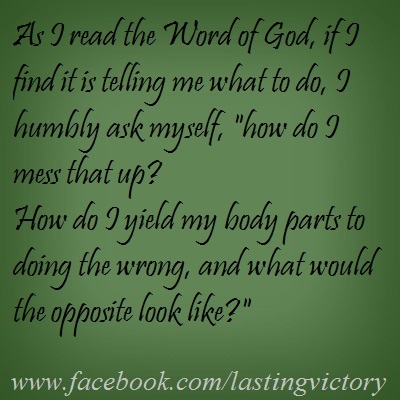 As I read the Word of God, if I find it is telling me what to do, I humbly ask myself, “How do I not do that? ” When it tells me what not to do, I ask, “How do I do that? How do I yield my body parts to doing the wrong, and what would the opposite look like? I can not spot God’s way by assuming that I naturally do it right and by attempting to go directly to application. Only if I am humble will I see God’s practical word by looking at myself honestly and openly in the light of God’s word, then admit that I can’t see the whole picture and that I am much worse than I can see. Then crying out in prayer I CAN’T- SO HELP ME, YOU CAN- SO THANK YOU, NOW SHOW ME HOW YOU WANT ME TO RESPOND.” Asking others to give me feedback, then consider the feedback, apply the feedback and reward the feedback. This entry was posted in Uncategorized and tagged BIBLE WORDS EXPLAINED. Bookmark the permalink.